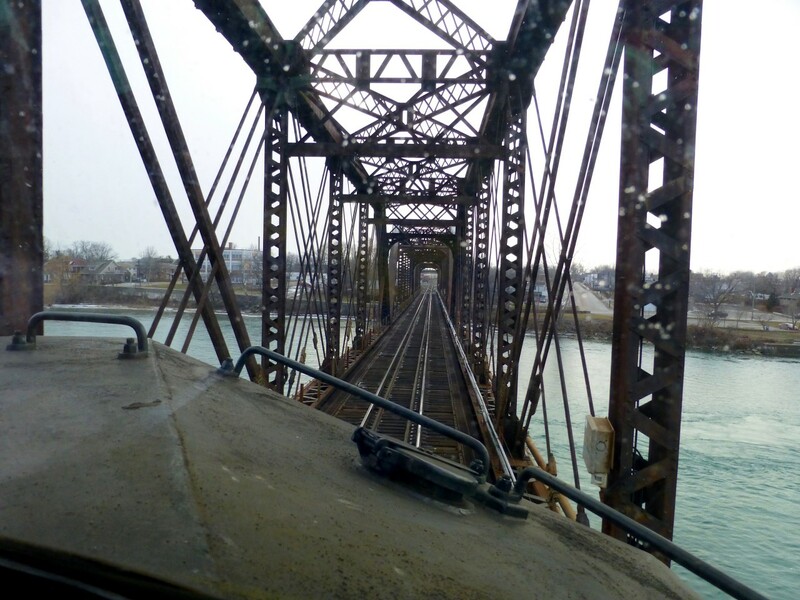 Railpictures.ca - ngineered4u Photo: CN 232 crosses over the Niagara River on the International Bridge (built in 1873) as it approaches Ft.Erie,Ont en route to Oakville, Ont. | Railpictures.ca – Canadian Railway Photography – photographie ferroviaire Canadienne. Caption: CN 232 crosses over the Niagara River on the International Bridge (built in 1873) as it approaches Ft.Erie,Ont en route to Oakville, Ont. Thanks aw. Yea I do get a pretty awesome view. Sorry things are not like the good old days where I could take you for ride. Railway politics? How come you didn’t get that 232? I actually should have been on 232. Raliways politics of course Happy to give you an engineers perspective. Too bad you weren’t on the BCOL 232 yesterday. I love this perspective btw! 232 has no average time as it only runs ocassionaly. I can run at anytime, but they prefer it to run after the GO rush hour. What time on average does it roll through? I remember it always coming by around 6. Very neat to see this from the engineer’s viewpoint. I look forward to seeing more of your images, Sir! Too funny, i just caught you out of the corner of my eye and saw the tripod and thought to myself..railfans are crazy trying to get “that shot” Yea 232 runs on ocassion, sometimes a couple days in a row. Its all about the control of the TTX fleet and who needs what most. You missed 531 as we were held on the Belt Line in Buffalo to clear and right behind him was NS 369. Waiting for us at Ft Erie was a Buffalo bound CP train. It was a bust dat at Ft. Erie. Lol. Yes, that was me. I tried to get a blur shot of the train going into the sunset as a nose shot would be way too dark. Didn’t work as well as I had hoped, but I was glad to see it. Haven’t seen 232 since the end of 2014. I actually was going to Fort Erie in hopes of seeing 531, and was shocked to see 232 pass the signal at Duff. Saw 232 again in good lighting today so it’s all good. I was Daniel. You were at Jordan? The dispatcher asked us while we were crossing Seaway if he could take the light at Jordan to let 98 go first, so we did. I did see someone close to a rail crossing with the camera on a tripod pointing west as the sun was setting? LOL was that you? Thanks D. I do feel blessed to be a railfan and a locomotive engineer. Its not everyone that gets to do something that they have wanted to do since they were 10 years old. Even after 35 years, the experience never gets old. 232 is hit and miss as its not a regular job and it only ran 6 times in the month of Feb. I always hope it would run more often. The traffic goes to Oakville mostly, but sometimes to Beechville. Keep taking those pics, I love to see them. This is a great shot of a location that so many of us have shot but will not experience this way. How often has 232 been running lately? I’ve heard it quite a few times but actually haven’t seen it yet. You were on 232? I guess you saw me at signal at signal 194 then. Nipping at the Amtrak’s heels.